The United Nations has voiced “shock” at the “terror” carried out by Israeli settlers that killed a Palestinian father of four, in the Israeli-occupied West Bank. “Today’s violence in al-Mughayer is shocking and unacceptable!” UN Special Coordinator for the Middle East Peace Process Nickolay Mladenov tweeted on Sunday, referring to a Palestinian village that was violently stormed by Israeli settlers and where they killed one Palestinian. “Israel must put an end to settler violence and bring those responsible to justice,” he said. 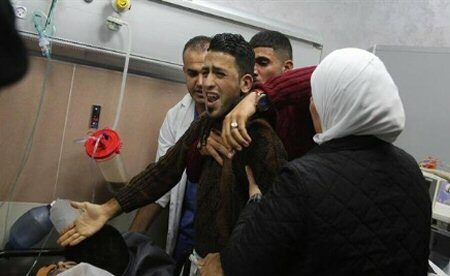 “My thoughts and prayers go out to the family of the Palestinian man killed and those injured. All must condemn violence, stand up to terror,” the envoy added. Thirty eight-year-old Hamdi Taleb Na’san was killed and 30 others were wounded after Israeli “settler volunteer security teams” and regime troops stormed al-Mughayer, located 27 kilometers northeast of the city of Ramallah, in the occupied territories, on Sunday. Israeli daily The Jerusalem Post claimed that the settlers were trying to find the “suspects” behind an alleged non-fatal stabbing of an Israeli hiker, and were joined by the military after attacking the village. On Saturday, Israeli forces killed a Palestinian in the city of Jerusalem al-Quds, after he reportedly failed to heed their call to stop his car. And, on Friday, Israeli forces fatally shot a Palestinian while targeting stone-throwing “suspects” along a central highway in the West Bank. The military killed another Palestinian when they fired at people protesting in favor of their right to return to their occupied homeland in the Israeli-blockaded Gaza Strip. Apart from Israeli soldiers, settlers engage in provocative, violent, and sometimes deadly actions against Palestinians on a regular basis. The most violent incident of the recent years involving Israeli settlers was an arson attack against a Palestinian home in the town of Douma, located 25 kilometers southeast of Nablus, in the northern West Bank, on July 31, 2015. The fire killed an 18-month-old baby boy, Ali Dawabsha, on the spot. Ali’s mother, Riham and her husband, Saad, were severely injured in the attack, and both died later, while in the hospital.